Since Trumpty-Dumpty is moving at a pace far-too-fast for mere mortal Dooney’s journalists to keep up with, our friends at BBC are asking us to share this dispatch from the front lines with you. On Sunday morning, Donald Trump went off on a Twitter tirade against a member of his own party. This, in itself, isn’t exactly huge news. It’s far from the first time the president has turned his rhetorical cannons on his own ranks. This time, however, his attacks were particularly biting and personal. 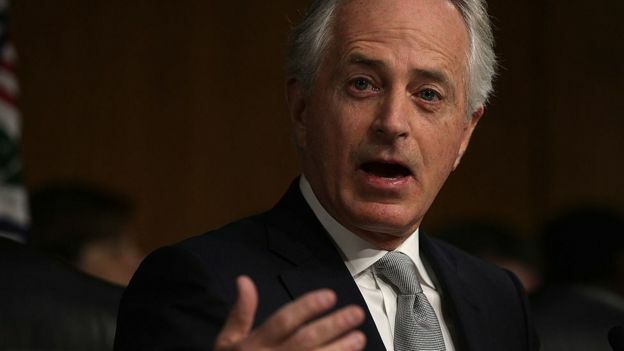 He essentially called Tennessee Senator Bob Corker, the chair of the powerful Senate Foreign Relations Committee, a coward for not running for re-election. He said Mr Corker “begged” for the president’s endorsement, which he refused to give. He wrongly claimed that Mr Corker’s support of the Iranian nuclear agreement was his only political accomplishment. Unlike some of his colleagues, Mr Corker – free from having to worry about his immediate political future – didn’t hold his tongue. That wasn’t the end of it, though. He then spoke with the New York Times and really let the president have it. Here are four choice quotes from the Tennessee senator’s interview with the Times and why they are particularly damning. You can’t really sugarcoat this one. Mr Corker is flat-out saying the president is a liar – and everyone knows it. The senator, in particular, is challenging Mr Trump’s insistence that he unsuccessfully pleaded for his endorsement, but the accusation is much broader. Mr Corker and the president used to be something akin to allies. The Tennessean was on Mr Trump’s short list for vice-president and secretary of state. Those days are seemingly very much over now – and it’s not like Mr Corker is going anywhere anytime soon. Although he’s not running for re-election, he’ll be in the Senate, chairing a powerful committee, until January 2019. The president’s margin for success in that chamber is razor-thin. If Democrats can continue to stand together in opposition, he can afford to lose only two votes out of 52 Republican senators. That’s why healthcare reform collapsed in July – and it could be bad news for tax efforts. 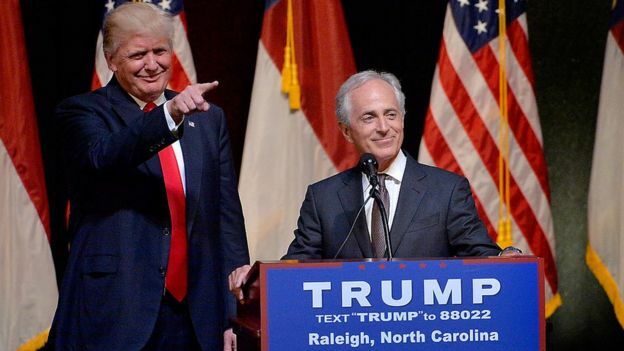 From here on out, Mr Corker isn’t going to do the president any favours. Frustration in Congress has been growing over what Republicans feel has been the president’s inability to focus on advancing their agenda. Getting a sharply divided party to come together on plans to repeal Obamacare, reform taxes or boost infrastructure spending is challenging enough. Doing so when the president stirs up unrelated controversies on a seemingly daily basis makes things all the harder. One of the president’s gifts has been his ability to shake off negative stories by quickly moving on to a different subject. That worked brilliantly during his presidential campaign, but it’s less effective during the legislative slow grind. For months, Republicans in Congress have been grumbling about this in the background and among themselves. Occasionally, someone like Mr McConnell will lament that the president doesn’t understand how the Senate works. Mr Corker has now stated it loud and clear. And, what’s more, he says almost everyone agrees with him. They’ve kept silent until now because they still hope to pass conservative legislation that the president can sign or fear Mr Trump’s legions will back a primary challenge next year or stay home during the general election. If that calculus ever changes – if it becomes riskier to stay silent than speak out – Mr Trump will be in real trouble. Time and again, Mr Trump has appeared to undercut Secretary of State Rex Tillerson and others in his administration who are attempting to use soft diplomacy to deal with a range of international crises. The war against the Taliban in Afghanistan, Iran’s compliance with the multinational nuclear agreement, the ongoing dispute between Qatar and its Persian Gulf neighbours, the unrest in Venezuela and, most recently, North Korea’s continued ballistic missile tests have all been the target of the president’s offhand remarks and Twitter invective. Some administration defenders have said this is all a part of Mr Trump’s strategy – an updated version of the Nixon-era “madman theory”, in which the president forces adversaries to give way because they fear an unpredictable US leader’s actions. 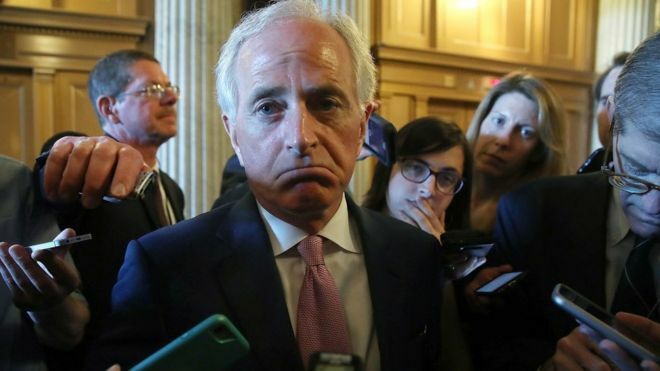 Mr Corker isn’t buying it. There’s no strategy, he says, just the possibility of chaos – which he hopes Mr Trump’s senior advisers will be able to avoid. There’s now a growing collection of John Kelly face-palm photos that serve as a testament to the chief-of-staff’s reported frustration at dealing with the president. 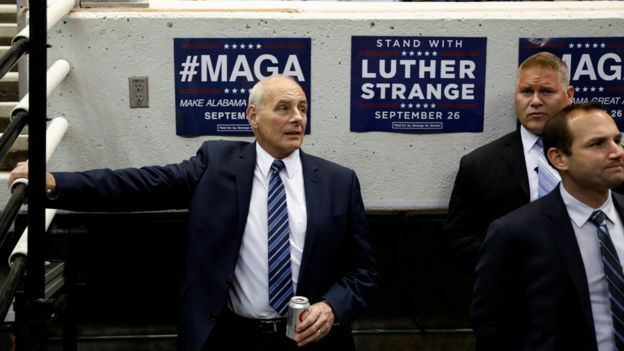 Mr Trump goes off-script to praise torch-bearing white nationalists at a rally in Charlottesville, and Mr Kelly is captured closing his eyes and rubbing the arch of his nose, as if attempting to stave off a migraine. The president calls North Korean leaders “criminals” in a speech to the United Nations, and Mr Kelly straight-up buries his face in his hands. The White House communications team is often left scrambling to try to explain or reframe an indelicate presidential “joke” or remark that directly contradicts what was until then the official administration line. Even though Mr Kelly has brought some discipline to the West Wing staff, the president still marches to the beat of his own drum – and continues to have unfettered access to his phone’s Twitter app. Bob Corker is only the latest person – politician, journalist, sports star or celebrity – to feel the mercurial president’s uncontainable ire.